This course was published in the April 2019 issue and expires April 2022. The author has no commercial conflicts of interest to disclose. This 2 credit hour self-study activity is electronically mediated. Explain risk factors for peri-implant mucositis and peri-implantitis, and the prevalence of these conditions. List some of the clinical factors that influence outcomes in dental implant therapy. 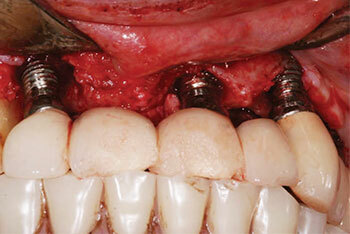 Discuss specific prosthesis design features that increase the risk of peri-implant disease. Describe treatment strategies to minimize the risk of peri-implant mucositis and peri-implantitis. Peri-implant disease is caused by the pathogenic components of oral biofilm,1 and the prevalence of peri-implantitis in patients with implants has been estimated at 12% to 22%.2 In addition, nearly 40% of this patient population presents with peri-implant mucositis.2 Frequently encountered in general and periodontal practice,3 peri-implant disease is a source of growing concern among oral health professionals. 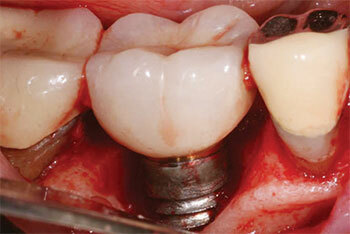 Often, the main focus of implant prosthesis design is esthetics. Design elements — such as emergence profile — are centered on creating a restoration that closely mimics the appearance of a natural tooth.4 In recent years, however, the connection between implant prosthesis design and peri-implant disease has gained attention, as it has become apparent that certain restoration design features increase the risk for peri-implant mucositis and peri-implantitis. The goal of every clinician is to deliver implant prostheses that are comfortable, functional, maintainable, and look like natural teeth. With a focus on bone-level implants, this article will present clinical information intended to help providers recognize design flaws in existing implant restorations, and avoid potential problems when designing new restorations. Studies show that marginal bone loss around the implant is greater when the abutment/crown margin is less than 2 to 3 mm from the marginal bone.7–9 The findings of these studies suggest marginal bone loss is associated with the physiologic establishment of biologic width around implants. 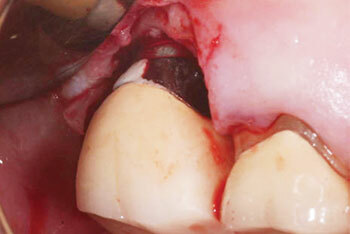 It would therefore seem prudent to place the abutment/crown margin more than 2 mm from the marginal bone. This may help avoid apical movement of the marginal bone and exposure of the implant surface to bacterial colonization (Figure 1). Placing the abutment/crown margin more than 2 mm from the marginal bone, even if it were supragingival, should not be objectionable to the patient in nonesthetic areas. FIGURE 1. The abutment/crown margin in site #30 is less than 2 mm from the abutment/implant margin. This short distance may have resulted in marginal bone loss that permitted bacterial colonization and subsequent peri-implantitis. FIGURE 2. The design of this prosthesis made it difficult for the patient to perform adequate oral hygiene. As a result, these implant sites developed peri-implantitis. FIGURE 3.Following healing from mucogingival flap surgery, adequate space for oral hygiene measures was noted; more specifically, sufficient space was developed to allow use of an interproximal cleaning aid between the implant sites. The inability to adequately remove microbial biofilm, by the patient or dental professional, has been associated with the development of peri-implant disease (Figure 2).10,11 Thus, proper restoration design plays an important role in preventing these conditions. In implant therapy, convex emergence profiles have been found to be a risk factor for peri-implantitis.12 Compared to single-unit restorations, full-mouth implant rehabilitations were found to pose a 16-time greater risk for peri-implantitis.13 This may be attributed to the difficulty in plaque removal by patients and professionals.10,11,13 In light of this, the design of any implant restoration should allow access that supports optimal oral hygiene around implant sites (Figure 3). FIGURE 4. Following reflection of a mucogingival flap, retained excess cement (seen in white) was found on the facial and distal aspects of the abutment. It should be noted this cement was not evident radiographically. Retained excess cement is a predisposing factor to peri-implant disease (Figure 4).14 According to Dalago et al,13 sites with cemented restorations were found to pose 3.6 times greater risk for peri-implantitis than sites with screw-retained prostheses. In addition, a study by Wilson15 notes that excess dental cement deposits were associated with signs of peri‐implant disease in 81% of the cases studied. Histopathologic evaluation of soft tissue biopsies of peri-implantitis sites revealed foreign bodies composed of dental cement.16 The amount of retained excess cement was found to increase with the depth of the undercut between the restoration and soft tissue.17 Another study reports that as the depth of the crown margin increases subgingivally, so does the amount of undetected excess cement.18 Furthermore, when restoring implants, radiographs are not considered a reliable method for detecting excess cement deposits. In order to reduce the risk for peri-implant disease, the crown margin should be placed at the level of the mucosal margin and provide sufficient access for removing excess cement.19 Clinicians are advised to be meticulous in their efforts to remove all retained excess cement. It is no surprise that higher pathogen counts were found in the gingival sulcus of peri-implantitis sites than healthy sites.22 Bacterial counts inside the implant/abutment connection, however, were found to be remarkably higher in peri-implantitis sites than healthy sites. This finding by Canullo et al22 was so significant the investigators referred to the implant/abutment connection as a potential reservoir for peri-implant disease. Given these findings, it would seem imperative that every effort be made to ensure the implant/abutment connection is tightly sealed (Figure 5). FIGURE 5. Implant site #3 was diagnosed with peri-implant mucositis. A radiograph revealed the abutment was not fully seated. 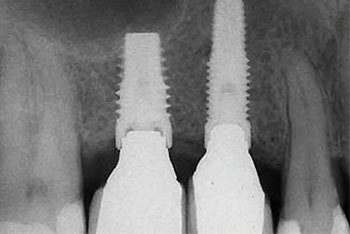 A gap can be seen at the abutment/implant connection. Microleakage from this gap could have contributed to the accumulation of pathogenic bacteria. FIGURE 6. Restored with a cement-retained bridge, implants sites #7, 9 and 11 were treated for peri-implantitis. These implants may also have been subject to excessive occlusal forces. Sites #8 and 9 had their incisal edges fractured off. Wear facets were noted in other sites. Implant prosthesis design plays an important role in determining the patient’s risk for developing peri-implant mucositis and peri-implantitis. As noted in the foregoing discussion, prosthetic design elements to be considered include abutment height, abutment/implant connections, prosthesis contours, retained excess cement, access for oral hygiene (especially self-care), and management of occlusal forces. With careful treatment planning, optimal restoration design, and regular follow-up visits, oral health professionals can support successful implant outcomes by reducing the risk of peri-implant disease. Caton JG, Armitage G, Berglundh T, et al. A new classification scheme for periodontal and peri-implant diseases and conditions — introduction and key changes from the 1999 classification. J Clin Periodontol. 2018;45(Suppl 20):S1–S8. Mir-Mari J, Mir-Orfila P, Figueiredo R, Valmaseda-Castellón E, Gay-Escoda C. Prevalence of peri-implant diseases. A cross-sectional study based on a private practice environment. J Clin Periodontol. 2012;39:490–494. Papathanasiou E, Finkelman M, Hanley J, Parashis AO. Prevalence, etiology and treatment of peri-implant mucositis and peri-implantitis: A survey of periodontists in the United States. J Periodontol. 2016;87:493–501. Su H, González-Martín O, Weisgold A, Lee E. Considerations of implant abutment and crown contour: critical contour and subcritical contour. Int J Periodontics Restorative Dent. 2010;30:335–343. Hermann JS, Buser D, Schenk RK, Cochran DL. Crestal bone changes around titanium implants. A histometric evaluation of unloaded non-submerged and submerged implants in the canine mandible. J Periodontol. 2000;71:1421–1424. Linkevicius T, Apse P, Grybauskas S, Puisys A. The influence of soft tissue thickness on crestal bone changes around implants: a 1-year prospective controlled clinical trial. Int J Oral Maxillofac Implants. 2009;24:712–719. Galindo-Moreno P, León-Cano A, Ortega-Oller I, et al. Prosthetic abutment height is a key factor in peri-implant marginal bone loss. J Dent Res. 2014;93(Suppl 7):80S–85S. Spinato S, Galindo-Moreno P, Bernardello F, Zaffe D. Minimum abutment height to eliminate bone loss: influence of implant neck design and platform switching. Int J Oral Maxillofac Implants. 2018;33:405–411. Blanco J, Pico A, Caneiro L, Nóvoa L, Batalla P, Martín-Lancharro P. Effect of abutment height on interproximal implant bone level in the early healing: a randomized clinical trial. Clin Oral Impl Res. 2018;29:108–117. Serino G, Ström C. Peri-implantitis in partially edentulous patients: association with inadequate plaque control. Clin Oral Implants Res. 2009;20:169–174. Jepsen S, Berglundh T, Genco R, et al. Primary prevention of peri-implantitis: managing peri-implant mucositis. J Clin Periodontol. 2015;42(Suppl 16):S152–S157. Katafuchi M, Weinstein BF, Leroux BG, Chen YW, Daubert DM. Restoration contour is a risk indicator for peri-implantitis: A cross-sectional radiographic analysis. J Clin Periodontol. 2018;45:225–232. Dalago HR, Schuldt Filho G, Rodrigues MA, Renvert S, Bianchini MA. Risk indicators for peri-implantitis. A cross-sectional study with 916 implants. Clin Oral Implants Res. 2017;28:144–150. Linkevicius T, Puisys A, Vindasiute E, Linkeviciene L, Apse P. Does residual cement around implant-supported restorations cause peri-implant disease? A retrospective case analysis. Clin Oral Implants Res. 2013;24:1179–1184. Wilson TG Jr. The positive relationship between excess cement and peri-implant disease: a prospective clinical endoscopic study. J Periodontol. 2009;80:1388–1392. Wilson TG Jr, Valderrama P, Burbano M, et al. Foreign bodies associated with peri-implantits human biopsies. J Periodontol. 2015;86:9–15. Vindasiute E, Puisys A, Maslova N, Linkeviciene L, Peciuliene V, Linkevicius T. Clinical factors influencing removal of the cement excess in implant-supported restorations. 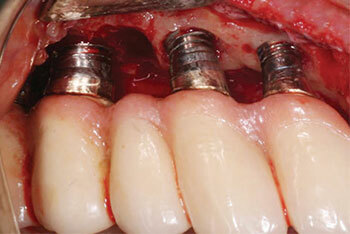 Clin Implant Dent Relat Res. 2015;17:771–778. Linkevicius T, Vindasiute E, Puisys A, Peciuliene V. The influence of margin location on the amount of undetected cement excess after delivery of cement-retained implant restorations. Clin Oral Implants Res. 2011;22:1379–1384. Staubli N, Walter C, Schmidt JC, Weiger R, Zitzmann NU. Excess cement and the risk of peri-implant disease — a systematic review. Clin Oral Implants Res. 2017;28:1278–1290. Mishra SK, Chowdhary R, Kumari S. Microleakage at the different implant abutment interface: a systematic review. J Clin Diagn Res. 2017;11:ZE10–ZE15. Lemos CA, Verri FR, Bonfante EA, Santiago Júnior JF, Pellizzer EP. Comparison of external and internal implant-abutment connections for implant supported prostheses. A systematic review and meta-analysis. J Dent. 2018;70:14–22. Canullo L, Peñarrocha-Oltra D, Covani U, Rossetti PH. Microbiologic and clinical findings of implants in healthy condition and with peri-implantitis. Int J Oral Maxillofac Implants. 2015;30:834–842. Duyck J, Vandamme K. The effect of loading on peri-implant bone: a critical review of the literature. J Oral Rehabil. 2014;41:783–794. Chang M, Chronopoulos V, Mattheos N. Impact of excessive occlusal load on successfully-osseointegrated dental implants: a literature review. J Investig Clin Dent. 2013;4:142–150. Fu JH, Hsu YT, Wang HL. Identifying occlusal overload and how to deal with it to avoid marginal bone loss around implants. Eur J Oral Implantol. 2012;5(Suppl):S91–S103. Sheridan RA, Decker AM, Plonka AB, Wang HL. The role of occlusion in implant therapy: a comprehensive updated review. Implant Dent. 2016;25:829–838. From Decisions in Dentistry. April 2019;5(4)28–31. Douglas H. Mahn, DDS, is a periodontist practicing in Manassas, Virginia, who specializes in perioplastic, bone regenerative and dental implant therapies. Mahn has more than 40 published articles in peer-reviewed journals and has lectured at national meetings. He can be reached at dmahn@cox.net.